As many of you know, I am a big tea drinker. If you look in my pantry, you will see over twenty different types of tea – ranging from Lipton to specialty import teas from Japan and China. I will even freely admit that I am a tea snob. While Daniel, my husband, isn't as big a fan of tea as I am, he does like my specialty teas from ITO EN. Those of you who have been my readers for awhile probably remember me reviewing their canned tea shots and their Ginger Tangerine Rooibos Tea. I loved their tea so much that part of my Christmas was being told I could spend $50 at ITO EN to try some more of their tea, and he is still assisting my ITO EN loose tea addiction. So, what is better than ordering ITO EN tea? Being asked to try one of their newest products for free! Recently, ITO EN asked me try their Teas' Tea unsweetened bottled tea, which just got a brand new redesign that not only looks spiffy, but makes them more environmentally friendly! What do I think of this new tea? Well, you will have to read more to find out! As you guys may have guessed, I am an ITO EN junky. After getting my first tin of tea, I was hooked on the brand. I don't say this because they give me free tea – I say it because this is truly the best tea I have ever tried. I am one of those people who put my money where my mouth is. If I tell you guys I like something, I have no problem buying it myself. This is the case with ITO EN. Along with the teas I have reviewed previously, my family has purchased three of their loose green teas, their chocolate chai, and their oolong tea – all of which are amazing. While ITO EN is still a fairly new company in the United States, they are well known in other places in the world, especially Japan. They have been making fine tea products, including loose tea, bottled tea, and traditional teas for over 30 years. Best of all, they are a company that believes strongly in social responsibility. They have incorporated eco-friendly practices in their business model and have received countless awards for many of their ground breaking earth-friendly business techniques. The coolest thing in my opinion is that they even upcycle the tea leaves themselves, using them to make uniforms, pens, park benches, and other items throughout Japan. They are also a major contributor to Whole Food's nonprofit, Whole Planet, a charity to help alleviate poverty in third world countries. As someone who tries to incorporate a lot of green concepts into her daily life, I feel confident I'm making a great decision buying my tea from ITO EN. While I am a big fan of ITO EN, I didn't really know much about their bottled tea. I was surprised to find out that they have been a pioneer and leader in the unsweetened tea market for over 10 years. Their all natural, ready to drink tea- Teas' Tea – goes through a meticulous brewing methods and only made with the best tea leaves. To make their tea taste even better, it is made with a specialty proprietary filtering method that reduces sediment creation, helping give their tea a clean, refreshing taste. Even looking at their tea in the bottle, you can tell it's clean and higher quality than many of the brands on the market. I'll admit, I never really thought bottled tea could look as pretty as the strained tea from my tea pot. What really impressed me about Teas' Tea, however, was the pretty, slim bottle. These slim bottles have a colorful, natural look to them, and more importantly, are very light! They are currently the lightest drink bottles on the market, weighing only 18.7 grams (a normal bottle weighs 24 grams). I found that this tea is great for throwing in my purse and I can fit two bottles in my backpack drink pouch, making it perfect for those times I'm on the go. What I love even more is that their bottles are also made of recyclable plastic bottles (PET). Not only is this better for those of us who try living green lifestyles, but also lowers the teas' overall environmental footprint since they can fit more of these bottles on trucks, using less fuel per bottle on their trucks. For my review, I was able to taste three of Teas' Tea's unsweetened tea flavors – green tea, rose green tea, and mint green tea. 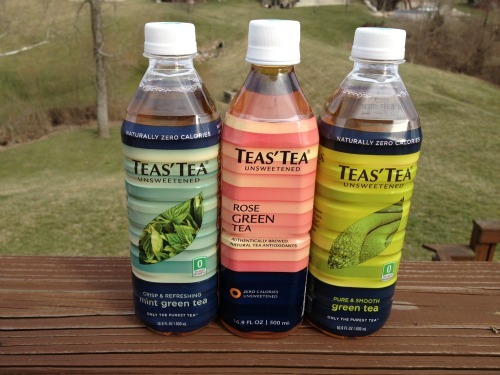 While the bottles are pretty and very light, the most important part is the flavor of the tea itself. Since I know I'm a tea snob, I asked different members of my family to try the tea and give me their opinions during Easter weekend. The tea that got the best scores and love was their plain green tea. This tea is refreshing and has a very clean taste. Since they are part of ITO EN, I wasn't too surprised. Their green tea has a very unique, flavorful taste that I have never experienced with any other brand. Even the members of my family who hated green tea loved this tea. The rose green tea was a close second favorite. Most members of my family liked this tea as well, but still preferred the flavor of Teas' Tea traditional green tea. As someone who loves tea, I have to say it is a tossup with the rose green tea and normal green tea. Both have a wonderful, refreshing taste that really doesn't need a sweetener. The tea is just that flavorful. The only tea that had mixed results with my family was the mint green tea. While no one really disliked it, they all thought it really didn't compare to the other two teas. If it was standing on its own, it probably would have really been liked, but compared to the plain green tea and rose green tea, there really wasn't much of a competition. Overall, all three of these teas were agreed to be at least pretty good, and liked by everyone who tested the three bottled teas. Based on my own experience and my family's opinion of all three Teas' Tea bottles, I have to say that this tea is amazing! Until I tried this tea, I bought Lipton tea or fresh brewed tea when I was getting tea on the go (That or free unsweetened tea in a plastic bottle the night before). Now, I am likely going to be purchasing this unsweetened bottle tea when I can find it. Everyone who tried this tea loved the flavor and that they were compact and very light. 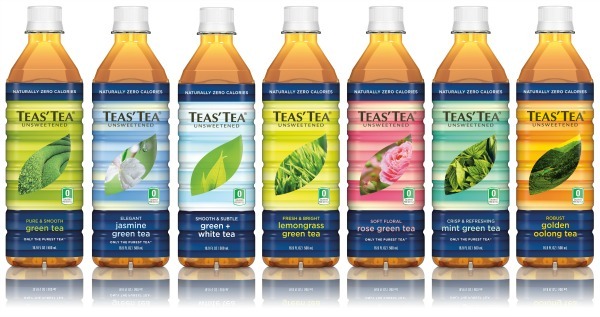 Based on our experience, I give Teas' Tea unsweetened bottle tea an A+ rating! Currently, you can purchase Teas' Tea at most natural and specialty stores throughout the nation for about $1.99 a bottle. You can also purchase this tea on the ITO EN website. If you would like to learn more about ITO EN, Teas' Tea, and their promotions, make sure to check out Teas Tea Facebook page, ITO EN's Facebook page, ITO EN's Twitter, Teas' Tea Twitter or their Pinterest Page! Disclosure: Budget Earth did not receive monetary compensation for this review, but did receive a pair of Yoga Hands for review purposes through Tomoson.com. All of the opinions on this blog are the opinions of said author and these opinions may differ from your own. I want to try these and I am really excited that they use the tea leaves for so many things! I have always loved this tea! the dark green unsweetened is the best. 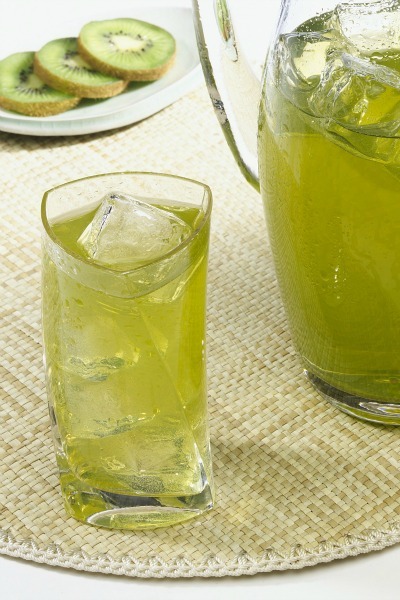 It has an earthy flavor and it is the healthiest drink besides water! The dark green unsweetend is the best! 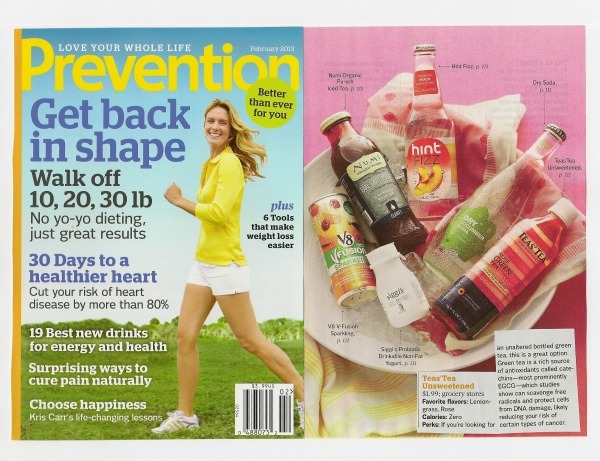 I have been drinking this for years….I gave up soda 10 years ago and this and water is all I enjoy these days! Good grean tea really is awesome! I've heard alot of great stuff about Teas Tea, so I loved finding out more from your review! Definitely would love to try! I'm going to be on the lookout for these. They sound good! These sound perfect, thanks for sharing. I would love to try the Half & Half. I love their teas! Thank you for the review/giveaway. I am trying to drink more green tea and less diet soda. I looked this up and they are in Gelsons and Whole Food stores in my area so I will give them a try. Thanks for sharing this. My mouth is watering! I LOVE tea and don't mind making it, but sometimes it's nice to have it ready to go! I can't wait to find this locally! I am trying to increase my tea intake and cut back on sodas. I've never heard of these before. Rose Tea sounds good. I love green tea and will have to give this a try.. I love tea, that is one drink that can help me calm and somehow can give me a soothing and relaxing effect. In fact I prefer tea than soda. I would love to try this one. I adore tea too. I really need to start drinking it more than soda. We got a Sodastream its been getting most of the attention in our house right now. I think once it gets old we will all be going back to our tea habits. I wonder if this is available in Canada? I'm a tea-aholic and I love that these drinks are unsweetened, I'm diabetic, so that's important! All the bottled and canned tea that I've seen is sweetened, so not good for me. I'd love to try these. I love all of the different flavors they offer. I have always loved tea and I am so glad that there are so many flavors that come in decaffeinated as well as regular and unsweetened – as a diabetic this is very important to me. the easy slim tea working good for me, i Have tried this tea, almost 6 months ago, I recomended, the first thing make me stomach easy for going 2 o 3 times to the bathroom, and no more bloating,no more constipation, thank for the tea, but , changed my life. Quite often I believe that there can be no longer fantastic articles on line any longer. The publish includes superb benefits. Sophie Adler Ich hab schnell jemanden erreicht nachdem ich mich ausgeschlossen hatte. Der Mitarbeiter war schnell da und schnell wieder weg, alles wie bestellt. Danke!